Piqua, Ohio…April 9, 2012. Thrush Aircraft has selected Hartzell Propeller Inc. as the preferred propeller provider on a Thrush aerial applicator powered by GE’s H80 engine. Hartzell has worked closely with Thrush Aircraft to select a propeller that would get the aircraft, with a full hopper, off the ground in the shortest possible distance. The project involved trying several blade designs, blade counts, profiles and diameters to determine the combination that provided optimal low speed performance for the aircraft. After extensive testing, Thrush selected the 4-blade lightweight turbine series 103″ diameter propeller that will be installed on the Thrush 510G when deliveries begin in the next few months. With a hopper capacity of 510 gallons, a gross weight of 10,500 pounds, and the flat-rated 800-shp H80 engine on the nose, the improved Thrush 510G is designed for superior performance for agricultural operations. Hartzell Propeller is widely recognized as the leader in advanced propeller design and manufacturing technology. The company has developed the next generation of propellers based upon innovative ‘blended airfoil” technology and is manufacturing these blades using a combination of revolutionary machining centers and robotics; and with its new ASC-II(TM) composite technology, to provide mission-optimized performance for its customers. 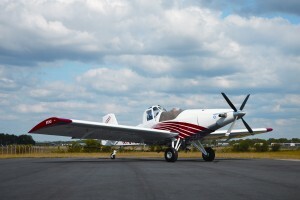 Headquartered in Albany, Georgia, Thrush Aircraft manufactures a full range of aerial application aircraft used in agriculture, forestry and fire fighting roles worldwide. Founded in 2003, Thrush is well-known for building the most durable aircraft in the aerial application industry, as well as the best flying – from both pilot and operator perspectives. All Thrush models provide superb visibility, light control response, and a high degree of maneuverability and speed, along with superior efficiency and low direct operating costs. Today there are more than 2200 Thrush aircraft operating in some 80 countries around the world.